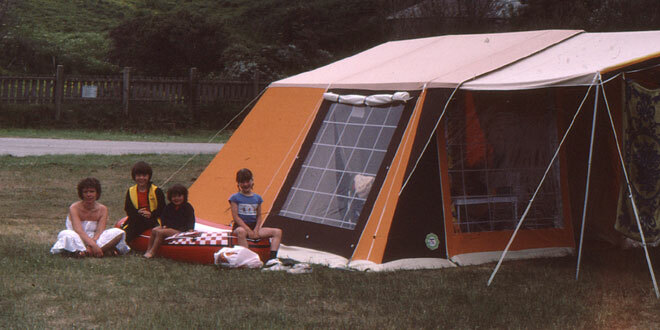 The Elliss family have been camping since I was a little boy – you can see me here, perched on the inflatable dinghy, at what I’d estimate was the age of 3 or 4. Check out the impressive-looking tent! Here’s another shot from my earliest camping memories – that’s me on the right, with my camping companions Andy and Megan. 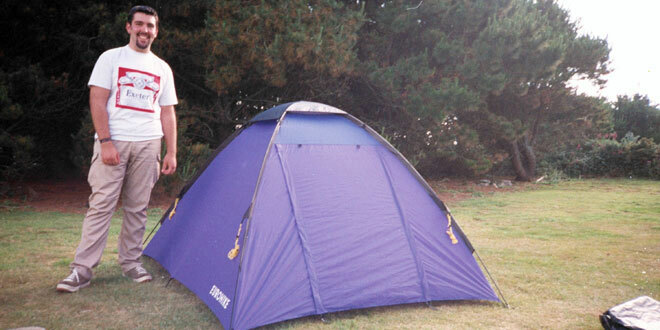 I’m not quite sure why our tent looks so sparce – I’m assuming it was being taken down at the time…! Even before the Elliss children came along, my parents were seasoned campers – my mother and father even went camping for their honeymoon. 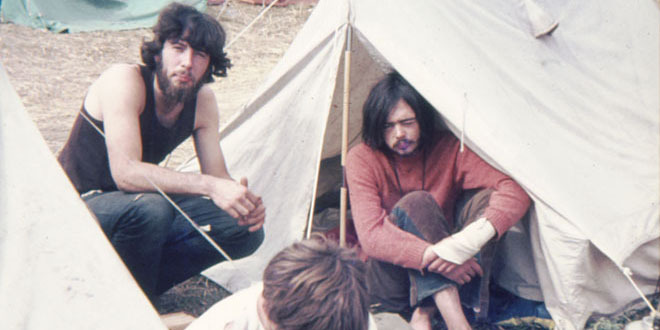 They also appear to have gone to some very dodgy-looking festivals, if this picture of my dad (and his friend, on the right) is anything to go by! 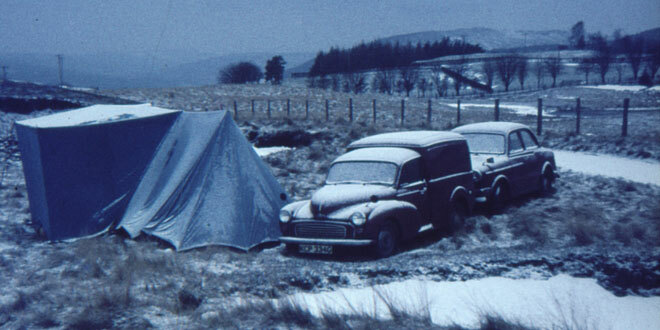 The camping force is so strong in the Elliss clan, my parents even went camping in the show – as you can see from this shot of them in Scotland, way before I was born. As you can see from my short, photographic interlude, there is a long history of camping in my family – so I’m really looking forward to getting back into it again. Whilst I suspect my camping skills might be a little rusty, I’m lucky enough to be married to a woman who takes organisation and planning to insane new levels. We’ve not even set foot on a campsite yet and Sara already has several Pinterest boards dedicated to camping tips, has organised a garage full of equipment, supplies and storage AND has almost everything packed already – despite it being another two days before we leave. With all this preparation and experience, I’m hoping that this will be the first of many great family camping holidays. Naturally I shall be telling you all about it when we come back (there might even be a few holiday snaps on Twitter if you’re interested – and if I find somewhere to charge my iPhone!) but if you have any good camping tips to share, now is the time to do so…! 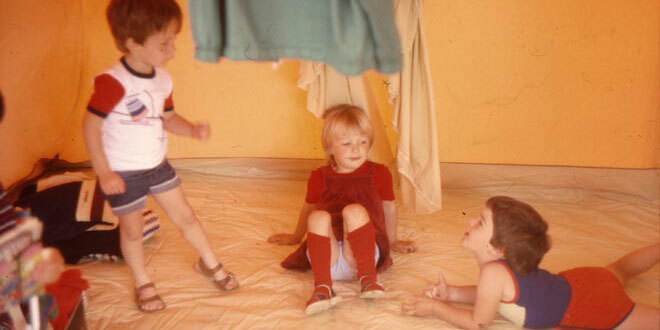 It is Father’s Day here in Brazil this Sunday and my present is going to be a tent. We shal then be going off on our first camping trip as a family so I am very interested in your experinces. Good luck! Hope the camping trip is going well / has gone well. My wife and I will be heading off on our first ever camping trip on Thursday, going to Cornwall with our four month old son.